Alberto was joined by the Head of Marketing at Everards, Erika Hardy, and her team to launch the staple Leicestershire beer in the prestigious House of Commons bar alongside the Chairman of the All Party Parliamentary Group for Beer, Mike Wood MP. 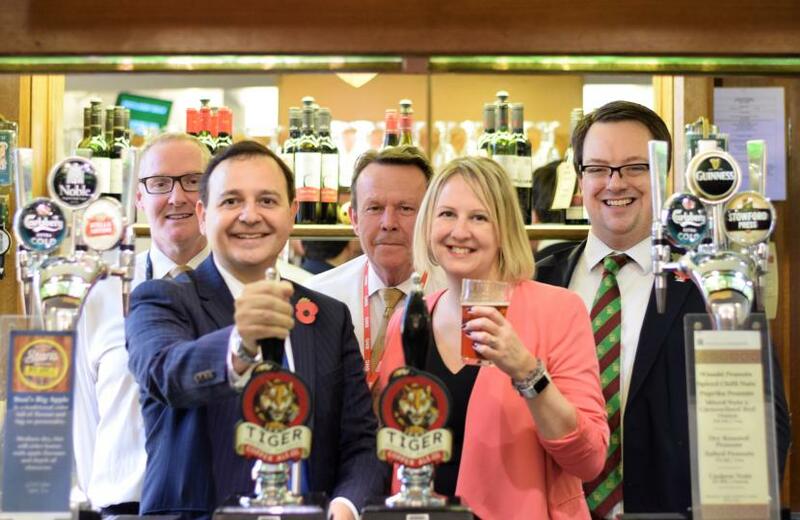 Alberto said, “I am absolutely delighted that the Strangers’ Bar in the Commons will be stocking Everards’ brilliant county brew, Tiger, for the next week as their guest ale. The Strangers’ is, unsurprisingly, a very popular place for MPs and their guests, so this is a brilliant opportunity to be able to showcase the very best of Leicestershire’s fantastic beer. I’ve already been approached by colleagues in the lobby around the House to ask if the bar can stock the beer permanently so Tiger seems to be going down very well”. Mrs Erika Hardy, Head of Marketing for Everards, added, “It’s great to have the opportunity to serve Tiger at the House of Commons. We’re so proud to be from Leicestershire so to have our beer pouring in such a historic building and enjoyed by lots of MPs and their guests is fantastic. “We really appreciate being nominated by Alberto Costa MP and were honoured to travel down to London and enjoy a pint in the Stranger’s Bar with him”. Alberto concluded, “Everards are a fantastic South Leicestershire company with a proud history and deep roots in the county, and I am so pleased to be able to share their wonderful beer with colleagues in Parliament. “The beer industry in Leicestershire is crucial to the local economy with over 30 breweries county-wide, so it’s hugely important that we do all we can to support our brilliant local breweries, such as Everards, to allow them to really thrive and grow”. The picture at the top of the article shows Alberto with Erika Hardy, Head of Marketing at Everards, and (L) Mike Wood MP for Dudley South and Chairman of the All Party Parliamentary Group for Beer.